To the uninitiated, it's pumpkin-spice season. For fans of beauty's darker side (or anyone who has ever #WCW'd Nancy from The Craft), the crisp air and changing leaves means it's officially the season of the witch. Come out of the broom closet for our favorite beauty tricks and treats. No black-clad teen can claim nihilism until their lips have met the sugared end of a clove cigarette. This unique, scented balm re-creates the experience sans nicotine: Bee balm spiked with vitamin E and aloe softens the lips, while notes of clove, lavender, rose, cinnamon, and vanilla mystify the palate. Followers of the Left-Hand Path will recognize Baphomet, the goat-head figure associated with the Church of Satan, carved into this shea butter and coconut oil soap. Activated charcoal provides the gargoyle-gray hue. Not into animal sacrifice? You'll be happy to know they're vegan and available in fragrances like Spa Date With the Devil (lavender, lemongrass) and Demon's Blood (amber, blood orange). 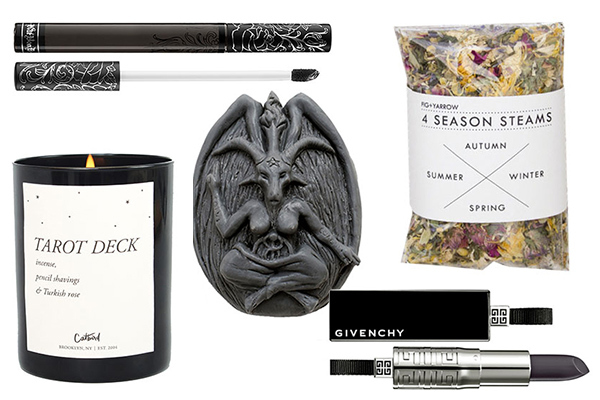 Black lipstick is having a major moment. Onyx lips graced several fall runways (Giles, Trussardi, and Emanuel Ungaro), and "It" girls Gigi Hadid, Kylie Jenner, and Rihanna have all worn it in a totally nonscary, un-goth way. Dark as calligraphy ink, this liquid formula has an edgy, matte finish and lasts for hours. Let's be honest: Black lipstick isn't for everyone. And if you clicked past the previous slide thinking, Nope! this magical tube is for you. The bullet looks black, but the balm glides onto lips as a sheer, just-bitten berry color that looks pretty on everyone. The number 93 is linked to Thelema, the philosophy founded by occultist Aleister Crowley. A numerical representation of its two main tenets, Will and Love, believers sometimes use it as a formal greeting or written sign-off. This body wash is as jiggly as a Jell-O shot, and it packs a similar buzz with energizing eucalyptus, peppermint, and cinnamon—it's the perfect treatment to cool and soothe sore muscles after a punishing run. Or strenuous ritual magick. Aquarius, the water-bearer, is the eleventh sign in the zodiac, and if you've ever heard that annoying song from the musical Hair, you might assume we're living in the Age of Aquarius. (That's actually up for debate: Some astrologers put the start of the New Age in the twentieth century, while some are holding out for the twenty-fifth century; Yogi Bhajan, who brought kundalini yoga to the U.S., says it happened around Thanksgiving in 1991.) No matter your timeline, this ultrahydrating serum with organic rose hip seed and jojoba oils takes its water-bearing duties seriously. Thank the gods of non-Abrahamic religions: OCC's once-messy, pigmented matte liquid lipstick now comes with an easy-to-apply doe-foot applicator. Pagan is a hedonistic shade of burnt purple; check out Technopagan for a metallic shade of electric violet-blue. This icy fragrance, named after Neptune's freezing-cold moon, is a lonely whiff of violet leaf, aldehyde, and snowbell. Mugwort, the VIP herb in every witch's pantry, is used for everything from protective smudging to aiding lucid dreams and astral projection. It's is also great for boosting circulation and can help clear up acne, which precisely why it's a main ingredient in this ten-minute mask. Wiccans celebrate the seasons with rites and festivals, and these herbal steams are a version of that...for your face. In a bowl, cover a handful of herbs with boiled water and place a towel over your head to create steam tent; breathe deeply for five to ten minutes. Tarot readers have long used the cards for divination; this newly relaunched Catbird soy candle can't reveal the future, but it does smell divine thanks to warm notes of incense, rose, and pencil shavings. In astronomy, the Seven Sisters is another name for a star cluster also known as Messier 45. In the Greek myths, they were known as immortal sisters Maia, Electra, Alcyone, Taygete, Asterope, Celaeno and Merope, daughters of the deity Atlas and the sea nymph Pleione. This cool purple-gray cream shadow has flecks of glitter that mirror the sparkling night sky.